The Californian Governor, Arnold Schwarzenegger, has given a rousing speech in support of Republican John McCain, in the swing state of Ohio. The ex-film star said Mr McCain was the real action hero who had spent more time as a prisoner of war than Barack Obama had served in the US Senate. Meanwhile Mr Obama is extending his campaign advertising into traditionally Republican territory. He will run ads in Arizona, his rival's home state, Georgia and North Dakota. 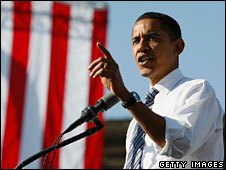 Will a few adverts become a 'surprise' Obama trip to Arizona over the weekend. One of the two adverts scheduled to air seeks to link Mr McCain, 72, to President George W Bush, suggesting the Republican would continue the same economic policies. The other relies on Mr Obama's message of "unity over division", highlighting his endorsement by high-profile Republican figures such as former Secretary of State Colin Powell. Polls suggest Mr Obama is closing the gap on Mr McCain in Georgia, with a CNN/Time/Opinion Research poll giving the Republican a five-point lead among likely voters. More than 30% of voters in Georgia have so far chosen to take advantage of early voting. Obama aides said the numbers were "highly encouraging". 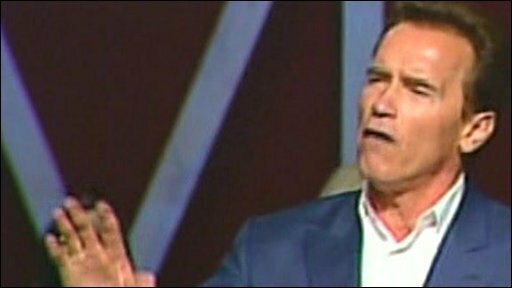 In Ohio - a crucial state in Tuesday's presidential election - Mr Schwarzenegger said that even though Mr Obama looked like he was going to win, Mr McCain had shown he could always fight back. No Republican has ever been elected without winning Ohio and Mr McCain appears to be behind in the polls there. But Mr McCain told a crowd of several thousand in Steubenville, Ohio, that he felt his campaign had a new momentum in the state. "You're going to be the battleground state again," he said. "You're going to be the one who decides. I need Ohio and I need you." McCain campaign manager Rick Davis dismissed the Democratic advance into Republican territory, saying he advised Mr Obama, 47, to focus his spending on states which Mr McCain intended to prise from him on election night. Mr Davis also told reporters that the campaign was "jazzed up" about Mr McCain's prospects, saying that he was living up to his reputation as the underdog who fights back. Ex-New York Mayor Rudy Giuliani, campaigning for his former rival for the Republican nomination, said Mr McCain was the candidate sticking up for ordinary Americans. "He's going to fight to see that your taxes are low and that the economy recovers," he said. Mr McCain's running mate, Sarah Palin, in Pennsylvania also focused on the economy, telling supporters that Mr Obama was "for bigger government and he's going to raise your taxes". The McCain campaign's efforts come a day after the Arizona senator made a late plea for donations. Speaking to big crowds at a rallies in Iowa and Indiana, Mr Obama urged his supporters not to become complacent and let the pace of campaigning drop. He warned that Mr McCain's campaign was likely to escalate into a final crescendo of attacks on him. Voters would see "more of the slash-and-burn, say-anything, do-anything politics that's calculated to divide and distract, to tear us apart, rather than bring us together", he said in Des Moines, Iowa. The Illinois senator then made a brief stop in his home city of Chicago to see his two young daughters at Halloween before moving on to Indiana, where he addressed more than 40,000 supporters in Highland, Indiana. Meanwhile, former Vice-President Al Gore campaigned for Mr Obama in Florida, another important swing state. He referred to his own defeat there in 2000, saying "it's been a long eight years" - and urged Florida's voters to "make good" on the challenge of electing Mr Obama as president.